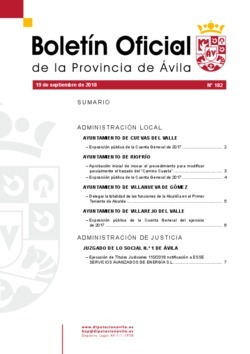 EJECUCIÓN DE TÍTULOS JUDICIALES 110/2018 NOTIFICACIÓN A ESSE SERVICIOS AVANZADOS DE ENERGÍA, S.L. APROBACIÓN INICIAL DE INCOAR EL PROCEDIMIENTO PARA MODIFICAR PARCIALMENTE EL TRAZADO DEL "CAMINO CUESTA". DELEGAR LA TOTALIDAD DE LA FUNCIONES DE LA ALCALDÍA EN EL PRIMER TENIENTE DE ALCALDE.